Medlar fruit and leaves, photo by Andrew Dunn and used via Creative Commons License. Guest post by Stella Otto, author of The Backyard Orchardist and the The Backyard Berry Book. What is this odd fruit, the medlar, mentioned often by Shakespeare and Chaucer? What is it that prompted Don Quixote and Sancho Panza to “stretch themselves out in the middle of a field and stuff themselves with medlars,” in Miguel de Cervantes’ epic novel? Adventurous gardeners have recently rediscovered this almost-lost 16th and 17th century fruit; not only is it tasty (though the complex flavor can invite multiple opinions), but it also makes a great specimen in the landscape. It has a history that goes back to somewhere between 700 and 3000 B.C. in the Black Sea coast of south-east Europe and south-west Asia. 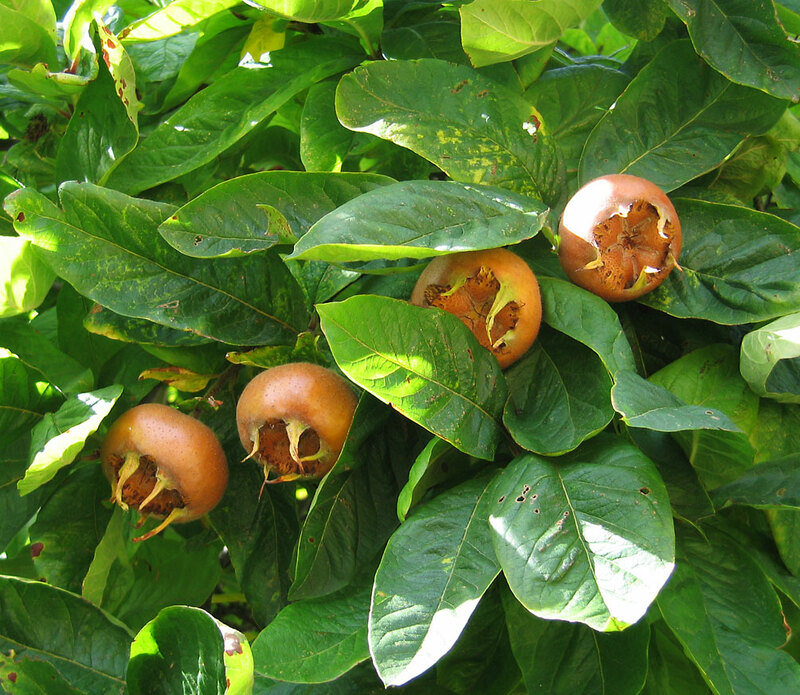 Medlars (Mespilus germanica), not to be mistaken for their unrelated namesake the Japanese medlar or loquat, have also been confused with their close relatives, hawthorn and cotoneaster. It is easy to see why: the fruit, with its open calyx end, looks like a cross between a small, russetted apple and a large hawthorn. A near-perfect description is that it looks like a squat, giant rose hip, and indeed, it is a member of the rose family. Additional botanical relatives include the squaw apple or wild crab apple which grows in California’s pine and juniper woodlands, and the Amelanchier or serviceberry. Beyond the medlar’s conversation-starting fruit, the tree’s blossom and growth habit lend itself well to the landscape. The medlar tree is small, under twenty feet, with grey-brown, plated bark on a gnarled trunk. 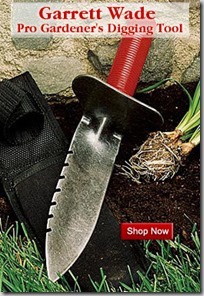 This makes it ideal as a singular focal point in a small garden. When allowed to develop a more shrub-like form, it is suitable as a mid-story plant in a permaculture food forest. In spring, two-inch white blossoms are borne on the branch tips of one year old wood, which look beautiful against against the oblong 3 to 6 inch long leaves. These pointed, hairy leaves turn a showy reddish-brown or yellow in autumn. Maintenance is easy. Minimal pruning is required and indeed near laissez-faire is a reasonable approach. The trees are slow-growing and long-lived, sometimes surviving several hundred years. Medlars love warm summers with mild winters, and do well with the acidic soil so often found in the rainy Pacific Northwest climate. They prefer a sunny, dry location in USDA zones 5-8. Due to the slow growth of own-rooted medlar trees, a cultivated variety is often grafted on a compatible rootstock— pear, quince A, or hawthorn. Graft incompatibility is not uncommon. 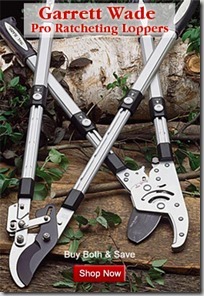 To avoid sudden breakage, this is one tree where planting the graft union below the soil is recommended. This will eventually encourage own rooting and will sustain the mature tree. For small garden spaces, Quince A in particular is often chosen to create a dwarf tree. One of the keys to keeping medlars thriving during their early years is to keep them well-watered in the first 3 to 4 years after planting. The wild rose-like flowers bloom late in spring, avoiding most frosts. Fruit set is usually heavy and may even be parthenocarpic (requiring no pollination). The blossom is self-fruitful, so a single tree can be planted without requiring an additional pollinator variety – however, it does take 3-5 years before a medlar will begin bearing fruit, so be patient. Popular, available cultivated varieties include Breda Giant favored for large, fine-textured fruit; Dutch/Dutch Giant for vigorous, almost weeping growth and large, tasty fruit; Marron™ for its productive, annual bearing and naturally compact form; Nottingham for what many consider the best-flavored fruit; and Royal for its prolific productivity. As a relative to the apple and pear, the medlar is potentially susceptible to similar pests and diseases, although it is sturdy enough to make problems rare. Cedar apple rust can be an issue in areas where that is a prevalent problem. Medlar fruit needs a long growing season to mature, even withstanding a few light frosts. One of the few plants that bears fruit in winter, medlars are mature for harvest just as leaves fall from the tree. At this stage, the greenish-yellow fruit is still rock hard, between an inch or two in diameter, and not yet ready to eat. Pick fruit when the stem loosens easily from the tree and the day is dry. The fruit will be hard and inedible with a high starch, acid, and tannin content. Similar to quince and persimmon, it will now have to undergo a ripening period of roughly 2 to 4 weeks, know as “bletting.” From the French, “blettir,” to make soft; bletting the fruit allows the cell walls to break down and the starches to convert to sugars while the acids and tannins decrease in a fermentation-like process. To blet the fruit, store it in a single layer in a cool, dry room with the calyx end down. The skin will turn darker brown and perhaps wrinkle a bit. Those new to medlars may think the fruit has spoiled as the flesh softens to a custard-like consistency with an almost cinnamon applesauce-like flavor. Once ripe, the fruit’s shelf-life is short. Fortunately, there are many ways to enjoy medlar pulp. It can be eaten directly from the skin with a spoon. (Be on the lookout for several large seeds. These can be sucked free of the pulp and discarded just like a cherry pit. There is a stoneless variety available, but it doesn’t taste as good as the other varieties.) Add a glass of port and a few hazelnuts for a simple and elegant dessert. The pulp can also be strained and blended into a creamy mousse or made into cider or wine. Its high pectin content lends it to preserves — jam, jelly, or chutney — as well. A curd-like “medlar cheese” is another option. Post provided by Stella Otto and adapted from The Backyard Orchardist: A complete guide to growing fruit trees in the home garden, 2nd ed. 2016. Stella Otto has authored two books, the award-winning The Backyard Orchardist: A complete guide to growing fruit trees in the home garden and The Backyard Berry Book: A hands-on guide to growing berries, brambles, and vine fruit in the home garden. She has written for numerous magazines, appeared on the Discovery Channel, and been on NPR and other gardening radio programs. Stella cultivates a fruitful 10-acre homestead in northern Michigan. She can also be found at her blog The Backyard Fruit Gardener at www.stellaotto.com. Thanks for the reminder! I have been wanting to get a medlar for a number of years. I have never heard of this fruit ~ but how unique. Looks so cool. Would be the talk of the town if I could grow here in Buffalo, NY!!!!! Medieval, interesting to have that in the name considering, time goes on. I live in the north so, I will have to try it first to taste and enjoy and if I do, then I will require a greenhouse. This fruit looks so nice and tasty however, I have never heard of this. But will look if I can get the seeds. I lived in Italy for over 20 years and had a couple of these wonderful trees. You generally need two for them to pollinate. The scent of the flowers is one of the most amazing treats, and the fruit is delicious. They grow well here in Sonoma County, at least away from the coast. The like the hot sun and probably prefer enough altitude for at least one hard frost every winter.